Reagan-adopted! | One Dog More! Who can pass up this face? Through no fault of her own Reagan is once again looking for her forever home. 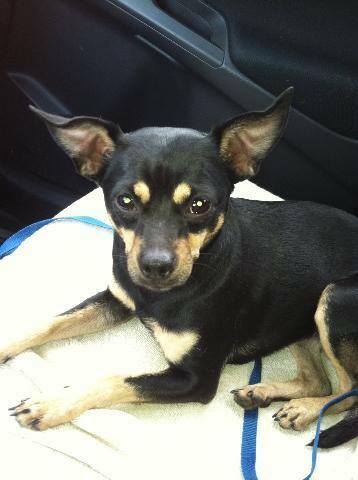 Reagan is a year old Min Pin/Chi mix that is just dying to sit in your lap. She is up to date on shots, heartworm negative, microchipped and spayed. She is good with cats and dogs and is housebroke and crate trained. Good with kids. She is 15 pounds to fun. Playful and cute as can be. She is very possessive of her human. Likes to be the dominant dog if there are other dogs in the house. Reagan would be a wonderful addition to any household. This entry was posted in Adopted! and tagged Chihuahua, female, min pin by onedogmore. Bookmark the permalink. I interested what do I have to do to adopt her? This is her foster mommy Alison. She us a great dog! Such a cuddler! The adoption application is online now. Fees are $250. Shots, spaying and all the transportation and care of her!